This is an article about the town in Jordan. For the ancient king of Axum, see GDRT. Umm Qais or Qays (Arabic: أم قيس‎, lit. "Mother of Qais") is a town in northern Jordan principally known for its proximity to the ruins of the ancient Gadara, also a former bishopric and present Latin Catholic titular see. It lies in the Bani Kinanah Department and Irbid Governorate in the extreme northwest of the country, near Jordan's borders with Israel and Syria. It is perched on a hilltop 378 metres (1,240 ft) above sea level overlooking the Sea of Tiberias, the Golan Heights, and the Yarmouk River gorge. Gadara (Hebrew: גדרה‎, Gadʾara, or גדר, Gader; Greek: Γάδαρα Gádara) was situated in a defensible position on a ridge accessible to the east but protected by steep falls on the other three sides. It was well-watered, with access to the Ain Qais spring and cisterns. A member of the Decapolis, Gadara was a center of Greek culture in the region, considered one of its most Hellenized and enjoying special political and religious status. By the third century BC the town was of some cultural importance. The Greek historian Polybius describes Gadara as being in 218 BC the "strongest of all places in the region". Nevertheless, it capitulated shortly afterwards when besieged by the Seleucid king Antiochus III of Syria. Under the Seleucids, it was also known as Antiochia (Ancient Greek: Αντιόχεια) or Antiochia Semiramis (Ancient Greek: Ἀντιόχεια Σεμίραμις, Antiókheia Semíramis) and as Seleucia (Ancient Greek: Σελεύκεια). The region passed in and out of the control of the Seleucid kings of Syria and the Ptolemies of Egypt. Gadara was captured and damaged by Alexander Jannaeus. In the early first century BC Gadara gave birth to its most famous son, Meleager. He was one of the most admired Hellenistic Greek poets, not only for his own works but also for his anthology of other poets, which formed the basis of the large collection known as the Greek Anthology. In 63 BC, when the Roman general Pompey placed the region under Roman control, he rebuilt Gadara and made it one of the semi-autonomous cities of the Roman Decapolis, and a bulwark against Nabataean expansion. But in 30 BC Augustus placed it under the control of the Jewish king Herod. The historian Josephus relates that after King Herod's death in 4 BC Gadara was made part of the Roman province of Syria. Gadara was the birthplace of the satirist Menippus (c. 1-50 CE), a slave who became a Cynic philosopher and satirized the follies of mankind in a mixture of prose and verse. His works have not survived, but were imitated by Varro and by Lucian. "So Vespasian marched to the city of Gadara. He came into it and slew all the youth, the Romans having no mercy on any age whatsoever. He set fire to the city and all the villas around it." The Gadarenes captured some of the boldest of the Jews, of whom several were put to death and others imprisoned. Some in the town surrendered to emperor Vespasian, who placed a garrison there. The 2nd century AD Roman aqueduct to Gadara supplied drinking water through a qanat 170 km (110 mi) long. Its longest underground section, running for 94 km, is the longest known tunnel from ancient times. Gadara continued to be an important town within the Eastern Roman Empire, and was long the seat of a Christian bishop. With the conquest of the Arabs, following the Battle of Yarmouk in 636 it came under Muslim rule. Around 747 it was largely destroyed by an earthquake, and was abandoned. The ancient walls may now be traced in almost their entire circuit of 3 km. One of the Roman roads ran eastward to Ḍer‛ah; and an aqueduct has been traced to the pool of Ḳhab, about 20 miles to the north of Ḍer‛ah. The ruins include those of "baths, two theaters, a hippodrome, colonnaded streets and, under the Romans, aqueducts," a temple, a basilica and other buildings, telling of a once splendid city. A paved street, with double colonnade, ran from east to west. The ruts worn in the paved road by the wheels of ancient vehicles are still to be seen. A different town called "Gader" (sic) is referred to in Jerusalem Talmud (Erubin 5:7) and the Tosefta (Erubin 6:13) within a Sabbath day's walking distance from Hamath, a town situated within one biblical mile to the south of Tiberias. 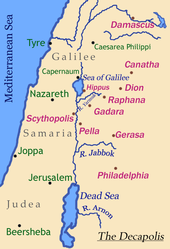 Ancient Gadara was important enough to become a suffragan bishopric of the Metropolitan Archbishopric of Scythopolis, the capital of the Roman province of Palestina Secunda, but it faded with the city after the Muslim conquest. The diocese was nominally restored no later than the 15th century as Titular bishopric of Gadaræ in Latin of Gadara in Curiate Italian, from 1925 renamed solely Gadara. View north from Umm Qais, with Sea of Galilee and Golan Heights visible. Umm Qais was recognised by Ulrich Seetzen in 1806 as the ancient site of Gadara. In 2017, archaeologists discovered an ancient temple that was built in the Hellenistic era in the 3rd century BC. The temple is believed that it was dedicated to Poseidon. Hellenistic pottery was also found on the site. The temple, built following the design of Distyle in antis, consists of a pronaos, a podium and a naos, the holy chamber of the temple. In addition, archaeologists has also discovered a network of water tunnels at the centre of the ancient town, which are separated from the external tunnel that was discovered decades ago in the area. Many visitors come to Umm Qais on day trips from the capital, Amman, roughly 110 kilometres (68 mi) to the south, to see its extensive ruins and enjoy its panoramic views. The Sea of Galilee and Tiberias, Israel, are visible, and just across the valley of the Yarmouk River is the southern end of the Golan Heights, Syria, under Israeli occupation since the Six-Day War in 1967. Mount Hermon bordering Lebanon is visible in the distance on clear days. At Beit Rousan – formerly the house of the Ottoman governor and now part of the complex – Greek statues and Christian mosaics are exhibited. ^ a b Schram, Wilke D. (2007), "Gadara (Jordan)", Roman Aqueducts, retrieved 25 September 2015 . ^ a b Mare, W. Harold (2000), "Decapolis", Eerdmans Dictionary of the Bible, Grand Rapids: Wm. B. Eerdmans Publishing, pp. 333–334, ISBN 0-8028-2400-5 . ^ Calmet, Augustin (1813). Calmet's Great Dictionary of the Holy Bible: Calmet's great dictionary of the Holy Bible. Samuel Etheridge. ^ Israel Shatzman, The Armies of the Hasmonaeans and Herod: From Hellenistic to Roman Frameworks, p. 74. ^ Fitzgerald, John Thomas; Obbink, Dirk D.; Holland, Glenn Stanfield (2004). Philodemus and the New Testament world [electronic resource]. BRILL. pp. 365–366. ISBN 9789004114609. ^ Josephus Antiquities, XVII, xi, 4; Josephus, Bellum Judaicum, II, vi, 3. ^ Josephus, Bellum Judaicum, II, xviii, 1. ^ Josephus, Wars of the Jews, Book 7. ^ Josephus, Bellum Judaicum, 5. ^ Josephus, Bellum Judaicum, IV, vii, 3. ^ Schürer, 1891, §23 (The Hellenistic Towns), p. 100 (note 179), where he cites Seetzen, Reisen durch Syrien (ed. by Kruse, 4 vols. 1854–59), i. 369 sqq., iv. 188 sqq. ^ For example:*UN Resolution 242, *Text of Resolution at UN.org (PDF), * "CRS Issue Brief for Congress: Israeli-United States Relations" (PDF). Congressional Research Service. April 5, 2002. Retrieved 2009-06-23. ,* "Presidency Statement on Golan Heights". April 1, 2004. Retrieved 2009-06-23. ,* "Israel and the Occupied Palestinian Territories". UK Foreign and Commonwealth Office. 11 June 2009. Archived from the original on 20 July 2009. Retrieved 2009-06-23. ,* "The Arab Peace Initiative, 2002". Al-Bab. 2002. Archived from the original on 4 June 2009. Retrieved 23 June 2009. Schürer, E. (1891). Geschichte des jüdischen Volkes im Zeitalter Jesu Christi [A History of the Jewish People in the Time of Jesus Christ]. 1. Translated by Miss Taylor. New York: Charles Scribner's Sons. Wikimedia Commons has media related to Umm Qais. This page was last edited on 24 October 2018, at 14:18 (UTC).